C. F. Martin 0-15 Model Flat Top Acoustic Guitar (1949), made in Nazareth, PA, serial # 110356, natural mahogany finish, mahogany body and neck, rosewood fingerboard, original black chipboard case. This is a super nicely preserved, great playing and sounding just-postwar 0-15, the lowest-ranked guitar model in Martin's 1940s line. The 0-15 is a study in careful economy; the finish was less polished out than the otherwise identical 0-17, but structurally the guitars were the same. The standard Martin appointments are reduced to the minimum. There is no ornament besides a W/B/W sound hole ring, tortoise celluloid pickguard, and gold Martin logo decal. The tuners are large-plate openback plastic-button Klusons typical of the late '40s. This small-bodied all-mahogany guitar has a surprisingly loud and rich voice, and sounds great finger or flat--picked. 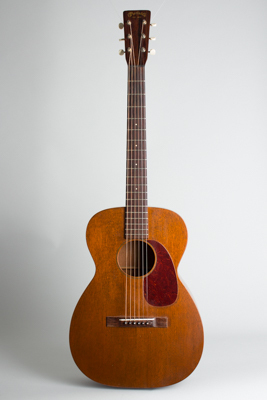 While this was the least expensive guitar Martin offered, listing for $50.00 in early 1950, it is still built to the expected Martin standard of quality and is an extremely fine instrument. A total of 750 of these little mahogany marvels were shipped from Nazareth in 1949, and this has to be one of the nicer surviving examples, complete in its original pebbled chipboard case. Overall length is 38 1/2 in. (97.8 cm. ), 13 1/2 in. (34.3 cm.) wide at lower bout, and 4 1/4 in. (10.8 cm.) in depth at side, taken at the end block. Scale length is 24 3/4 in. (629 mm.). Width of nut is 1 11/16 in. (43 mm.). This is a VERY clean and all-original guitar, showing just some light handling wear. It appears to have been played very little since new. The bridge looks to have been reglued and there is a small grain pull to the mahogany top just in front of it under the D string. The only crack repair is a typical grain split along the top edge of the pickguard, neatly sealed and cleated. This is as nice a 1940s Martin as we usually expect to see, and an excellent player with a fine ringing tone. Even the original chipboard case is very well-preserved and still quite functional. Excellent + Condition.